As someone who has studied, and, is now working in Finance, I was pretty much impressed by this book. How did I come across it in the first place? Well, I was reading Vogue India the other day, when I stumbled upon an interview of the author Ruchir Sharma. Whoever said that women magazine’s was useless? As the title suggests, this book is not about Africa per se, but it is more about emerging markets as a group. After a decade of rapid growth, the world’s most celebrated emerging markets are slowing down. Which countries will rise to become the next economic stars? 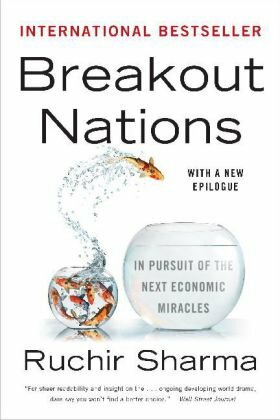 In the best-selling BREAKOUT NATIONS: In Pursuit of the Next Economic Miracles, Ruchir Sharma, writer and head of emerging markets at Morgan Stanley, draws on two decades spent touring the globe to offer insights into the most promising emerging markets. Sharma reveals his rules for spotting success stories and lays out a compelling argument for which nations will thrive, and which will falter, in a global economy reshaped by the crisis of 2008. Since the hardcover appeared in early 2012, the story has played out much as Sharma predicted. There has been a slowdown across all the emerging markets, with the most hyped emerging markets—particularly Brazil, Russia, India and China—faring among the worst, and new success stories appearing in previously unsung nations like the Philippines, Turkey and Nigeria. These days, when we hear emerging markets, we think automatically of the BRICS. It is true that they used to be the poster child of the emerging markets movement for the last two decades. However, things have changed a lot since the word “BRIC” (without South Africa who joined the group later) was coined in the early 2000’s. Nowadays, a lot of African nations are part of the emerging nations group. These countries are growing at 5% or more per year. I will not discuss all the emerging markets mentioned in this book. I will, however, say a word or two about South Africa and Nigeria. Remark that a lot of African nations have been mentioned throughout the book, but the author put more emphasis on these two. ANC honeymoon : We get it, the ANC help liberated black people, I think now is about time to deliver on their promises. South African companies earn more than 50% of their revenues outside of the country, this is very bad for the development of any country, let alone an African one. South Africa social set-up will blow up at one point, it is inevitable. The author has a great theory about blowing up and then rebuilding your self, hopefully more strongly. And to effectively rebuild yourself, you will have to reach the very bottom. The work situation: Workers have too many powers and are not that productive when we compare them to the rest of the world. Again, we have another case for a blow-up of the social situation. The Fourth Frontier: The Nigerian Case: A lot have been said about Nigeria, you would be excuse to think that it is the next China or Brazil. One should beware of glossy and shiny predictions and reports made by the big consulting companies. That being said, we simply cannot ignore the potential Nigeria represents. Ruchir thinks that Nigeria has the potential to become a breakout nations in the next 10 to 15 years. The only issue I see is that Nigeria’s growth is contingent to so many things. Also, he is calling President Goodluck Jonathan , an effective leader by accident on the book. I will leave it to that. Out of 300 plus pages, less than 10 pages are about the whole continent. Africa is called the “missing billion” in the book. It doesn’t seem right to me. Even though, the continent does weight much on the global trade. I would expect a company like Morgan Stanley who chases after growth to at least do a more in-depth analysis of the African countries. If any dramatic growth is about to break somewhere, it is going to be in Africa, not Asia. So it was quite strange. Insights about some emerging countries was just wonderful. I could’t help but imagine ,what if we have this same analysis done for some African countries. It would be incredible. It not realist to expect analysis for the 54 countries. If you are in business and have some time to spare, I recommend.